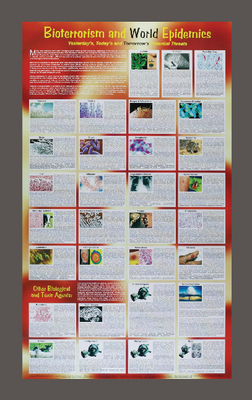 Thirty-one different biological and chemical agents are showcased with color photos and descriptive text. The information covered for each agent includes symptoms of exposure, as well as other pertinent information. Some agents covered on the chart include Anthrax, smallpox, west Nile virus, cholera, Ebola, plague, botulism, lyme disease, pneumonia, HIV, and various chemical warfare agents. It also comes with a teacher’s resource sheet.